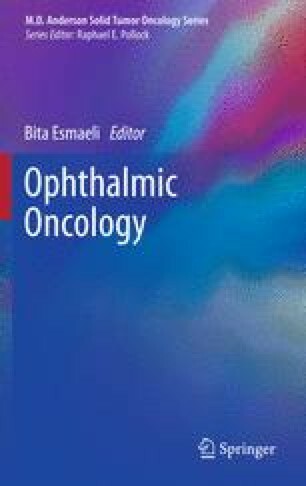 Many optic neuropathies in cancer patients are related to the direct effect of cancer on the optic nerve (e.g., orbital and parasellar skull base compressive lesions or infiltration of the optic nerve with leptomeningeal disease). However, a number of optic neuropathies occur unrelated to those mechanisms. Other mechanisms of optic neuropathy in cancer patients include those caused by raised intracranial pressure (ICP), nutritional deficiencies, drugs, and radiation injury. Optic neuropathy related to elevated ICP does not initially affect vision; therefore, early recognition of the underlying problem is important for visual preservation. In patients with nutritional or drug-related optic neuropathy, symptoms and signs usually present simultaneously and bilaterally with visual loss that is progressive and painless; color vision is affected early on, but pupil examination may remain normal. The nutritional deficiencies may present slowly and symmetrically, and potential deficiencies include vitamins B12, folate, and thiamine B1. Radiation-related optic neuropathy often manifests within about 18 months after radiotherapy and usually after cumulative radiation doses greater than 50 Gy or single doses greater than 10 Gy. Patients often do not have optic disc swelling, and they develop progressive visual loss over weeks to months, with bilateral sequential loss being more common; the end result is vision of 20/200 or worse. Rarely, paraneoplastic syndrome can result in an optic neuropathy.